Nessos is a game by Takaaki Sayama and Toshiki Arao, published by IELLO. It is for 3-6 players. In this game, players will be trying to win the Amphora cards of the most interesting creatures as they vie for title of the god’s Chosen One. Of course they’ll have to be careful as the terrible Charon could be lying in wait to eliminate them. In the end, the player that can gain the right amount of points first, will be declared the winner. To begin, the deck of Amphora cards are shuffled together. It should be noted that certain cards will be left out of the deck before shuffling, depending on the number of players. Once the deck is shuffled, each player is dealt 5 cards. The remaining cards are placed face down in the center of the table. The first player is chosen and is given the First Player pawn, which is placed in front of them. Play now begins. The game is played in a series of rounds. Each round, the player with the First Player pawn will choose a card from their hand and places it face down in front of another player. If the card is a Creature card, the player must say the number of the card out loud without lying. If the card is a Charon card, the player must lie and say any number out loud. The player that receives the card then has 3 choices that they can make. They can accept the card without looking at it and place it face up in front of themself. They can refuse the card without looking at it, causing the card to be returned to the player that offered it. The card is then placed face up in front of that player. Finally, they may add a card from their own hand, placing it face down with the other card. They will then offer these 2 cards to another player. The player is only allowed to lie about the Charon cards that they offer, announcing a number of their choosing. In this last case, the new player that received the 2 cards now has the same choices; to accept them, refuse them and return them to the previous player or to add a card from their hand and offer the 3 cards to a different player. Just like before, they may only lie about the Charon card. In this last case, the player receiving the 3 cards only has 2 options. They can accept them and place them in front of themself or they may refuse them and return them to the previous player that offered them who must place them face up in front of themself. Once the cards are flipped face up, regardless of the case, the round ends. If a player has 3 Charon cards face up in front of them, they immediately lose and are eliminated from the game. Their cards are left face up in front of them. If the player acquires any number cards, they are added to their total points. It should be noted that if a player has a set of 1, 2 and 3 point cards in front of them, they gain an extra 10 bonus points per set. If a player gets the number of points required, based on the number of players, the game ends. This player is the winner. If the player doesn’t have the points required yet, the game continues with a new round. Players with less than 5 cards draw the required amount to get their hands back to 5. The first player pawn is passed to the next player in turn order and a new round begins. The game continues until one player acquires the total amount of points to win the game, or if all but one player have eliminated from the game due to Charon cards. The game can also end if there are 9 Charon cards face up in front of all players. In this case, players add up their points and the one with the most points is the winner. This game contains only 2 parts; a deck of cards and a first player pawn. The pawn is a simple unfinished wooden piece that looks like a vase or possibly a empty spool of thread. It’s sturdy but small and is good for reminding you of who the first player is. The cards are very good quality. The artwork is very nice and looks like the painted vase that the game is supposed to be based on. I like the unique looking designs and find them very intriguing. Each card has a very nice finish to it. The one problem that I can see is that these have black borders on them. That means that as these cards are shuffled, they’ll start to show wear pretty quickly around the edges. Of course you can always sleeve them and it wouldn’t be such a problem. Other than that, there’s nothing out of the ordinary or amazing that’s gonna blow you away. It’s simply a stack of cards, nice as they may be. As for the theme, it’s pretty much pasted on. There could be anything from dinosaurs to goblins on these cards and it wouldn’t really have mattered. Granted, I like Greek mythology, so the images work for me. Of course that might not be the case with everyone. Overall I like the designs and think for a mini game, it’s pretty nice looking. I’m not going to rant too much over this one. It gets the job done. Much like the game itself, the rulebook is quite small. At only 12 pages, there’s not a lot to discuss. There aren’t a whole lot of pictures but what’s here is pretty good. 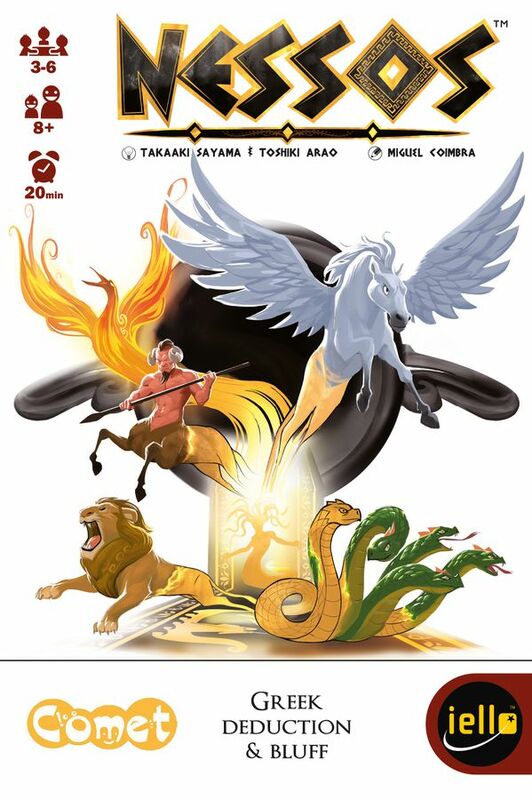 That includes the last page which has a picture of all the mythological creatures and a history behind the name of the game. There aren’t really any examples of gameplay in the book, but everything is pretty easy to understand anyway. Everything is quite easy to read. The rules do a good job of explaining how to play the game in a neat and organized way. Overall while there’s not a lot of information here, the book gives you everything you need to know in a quick and concise format. I can’t really complain here. Like the components, the rulebook gets the job done. This isn’t a bad game. It’s just not my style. As a filler style card game, I guess it works. It’s really quick and easy to play. It doesn’t take a lot to learn and is pretty simple. It is quite mathy though. There’s a lot of addition that you kind of have to do in your head to keep track of everything. The game looks quite nice. I’m just not a big fan of bluffing style card games. Maybe it’s just that I’m not a very good liar. I wind up telling on myself every time. Games like Werewolf and others of that nature, never really worked very well for me. Thematically this game could have been about anything and it wouldn’t have really mattered. I do like the Greek Mythology theme, it’s just that for this game, it’s simply pasted on. I will say that I probably like this one a bit better than other bluffing style card games. It gives you enough of a challenge to be somewhat fun. Like I said, if you’re just throwing this one in the middle of a night of heavy gaming, it works fine. The game is, after all, a mini game. The box even says it. I think that as it is it works well enough. The main idea is to get enough points to win the game without getting too many Charon cards to be eliminated. You will find that as you start getting too many points, it’s very likely that the other players are gonna start throwing Charon cards at you. The main thing is knowing your opponents well enough to determine if they’re lying to you and have placed a Charon or if they’re telling the truth about the card they’re giving you. To me, it’s more like poker, as you’re playing the other players more than you’re actually playing the game. I think if you like bluffing games like Wallet or Werewolf, you’ll more than likely enjoy this one too. For me, it’s a try it before you buy it. As I said earlier, it’s not a bad game. It’s just not my style. I can see the good qualities of the game, even though it’s not for me. 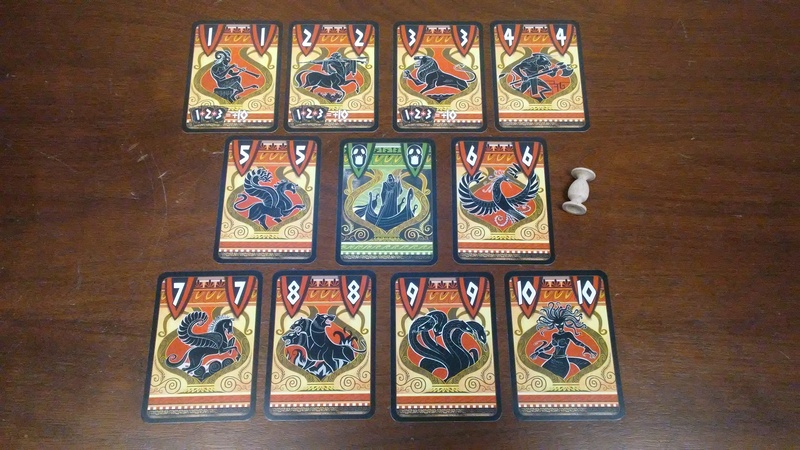 Nessos is a card game of bluffing and deduction with a Greek mythology theme. The game is rather quick. Most game sessions last around 15-20 minutes. The cards look quite nice and have some really cool looking artwork reminiscent of the painted Greek vase that the game was based on. The rulebook is small and concise and does a good job of explaining the rules. The game itself is a nice filler style card game that involves a good bit of bluffing. Unfortunately the theme is merely pasted one, the game could have been about anything. I don’t think it would have made a lot of difference on the enjoyment of the game. At least not for me. I’m not all that big on these types of games, but I can appreciate it for what it is. When compared to other games of the same type, this one is a bit better, although a bit mathy if you ask me. Fans of bluffing games like Wallet or Werewolf will most likely enjoy this one as well. Even though I like Greek mythology, for me this game is just not my style. This is one that I’d recommend trying first. This entry was posted in Reviews and tagged arao, board, board games, card, card games, games, greek, iello, iello games, mythology, nessos, sayama, takaaki, Takaaki Sayama, toshiki, Toshiki Arao. Bookmark the permalink.